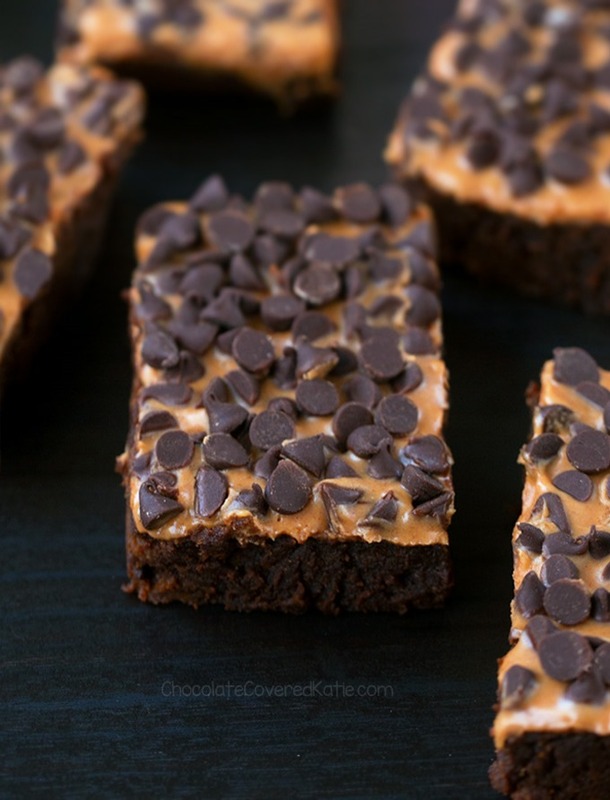 Dark chocolate flourless pumpkin brownies, made with just 7 ingredients! 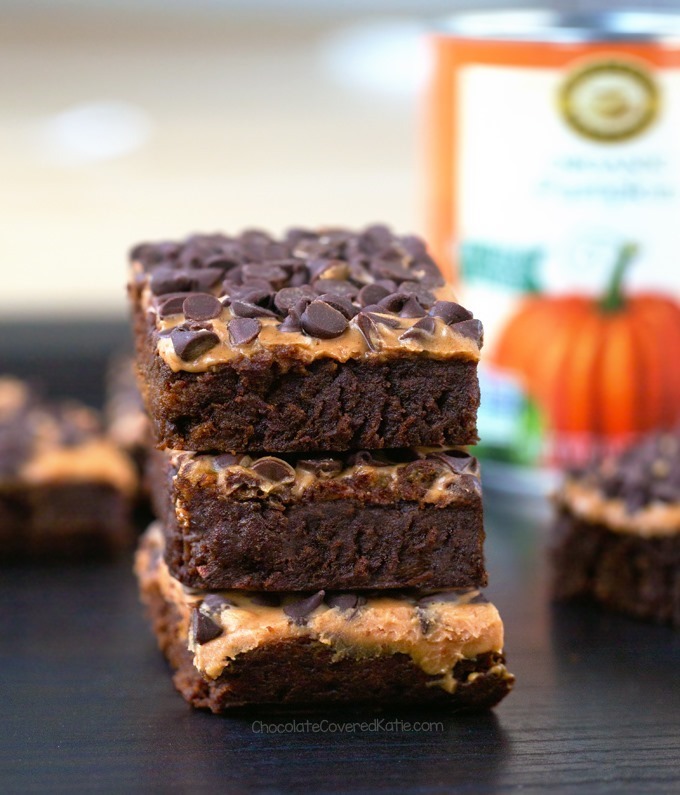 The pumpkin adds so much moisture to these brownies, without all the extra fat and calories, keeping them super soft and fudgy! It also gives you Vitamin A, which you wouldn’t get from brownies made with oil. Not that anyone’s reason for eating a brownie is to get more Vitamin A… but it’s a nice bonus. You can eat them unfrosted or top the brownies with any favorite frosting recipe. I chose to frost them with my Pumpkin Peanut Butter. Or you can simply press some mini chocolate chips on top right before they go in the oven for an easy no-frosting brownie that is ultra chocolatey. I opted for both frosting and mini chocolate chips in these healthy pumpkin brownies, because I’m indecisive like that. If you’re not a pumpkin person—or even if you are—be sure to check out the Mint Chocolate Chip version! Are there any other workout brownie flavors you’d like to see? Please feel free to leave suggestions in the comments below, because I love hearing your ideas. 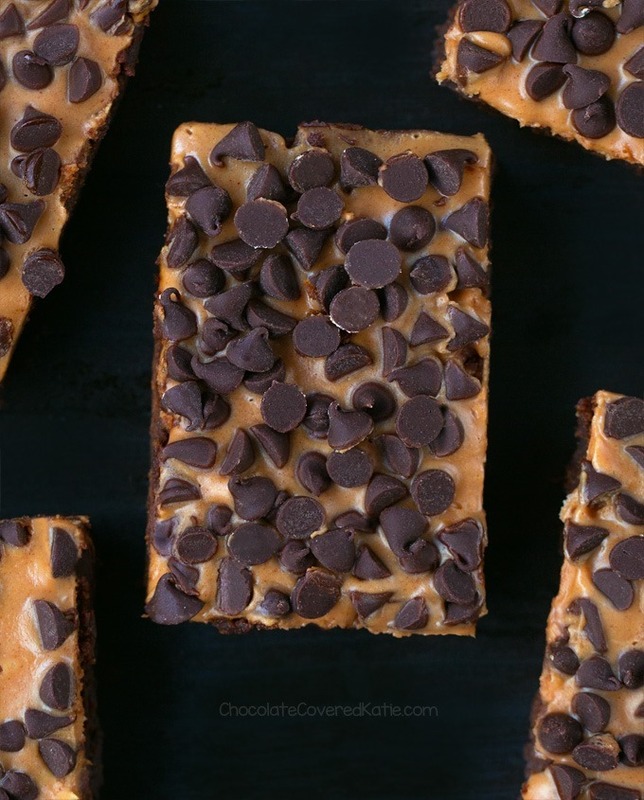 A Fall-inspired version of the popular Chocolate Workout Brownies. Note: Sunbutter or pumpkin seed butter can be used for allergy-friendly brownies. You can use regular unsweetened cocoa or a combination of regular and dutch. Preheat oven to 325 F. Line an 8-inch pan with parchment. Gently warm almond butter until it is easily stir-able. Combine all ingredients in a bowl, stir until completely smooth, and spread into the prepared pan (see video). Bake on the center rack 20-25 minutes (20 for extra fudgy brownies) – they will be undercooked when you take them out. Let cool, then loosely cover with a paper towel and refrigerate overnight, during which time they firm up without losing their fudginess. They’re also much sweeter the next day! Frost as desired – I iced the brownies with Pumpkin Peanut Butter, recipe linked earlier in this post. Refrigerate leftovers 2-3 days or cut and freeze up to a month. You can eat them straight from the freezer if you wish! 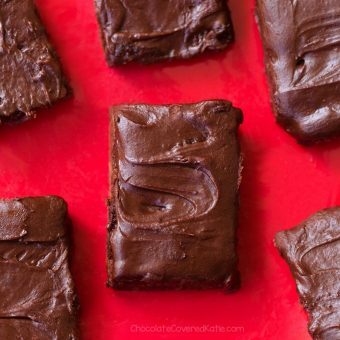 As I mention in the original version, these brownies are more of a healthy snack than something you’d make for a bake sale or party. If you enjoy desserts that do taste a bit healthier than their traditional counterparts, hopefully you will love these too! Mmmm I love the pumpkin peanut butter topping! This would definitely make all the other gym-goers jealous when I whip this out after bodypump! Yum! I might have to give these a try, being pumpkin season and all. I only have vanilla protein powder. Do you think that would make much of a difference as far as flavor? I think it sounds like it would be delicious. Just a bit less chocolatey. Bring on all the pumpkin! These look incredible! Gingerbread workout brownies for the Christmas season? These look so delicious! Strawberry cheesecake or cranberry orange? Strawberry cheesecake brownies sound fantastic! The frosting doesn’t look the same in this pic as it does in your link – did you add anything additonall to the frosting for the brownies? Thanks! These look divine!! Can’t wait to make these at the weekend. These look so good and I can’t wait to try them! Do the nutrition facts include the pumpkin peanut butter frosting? No, they are the brownies only. do you have alternatives to try for the almond butter due to nut allergies? 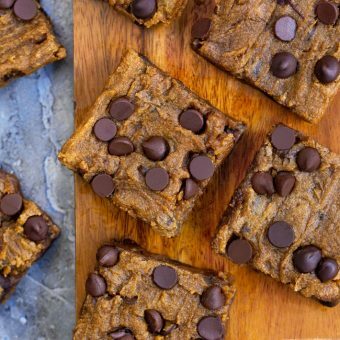 You can use pumpkin seed butter or sunbutter instead. 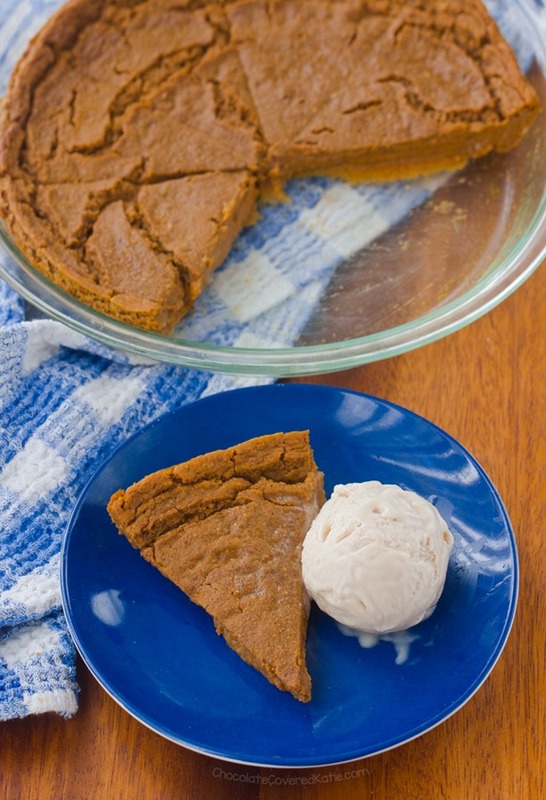 Why decide between pumpkin and almond/peanut butter when you can have both?! Love this idea and how gooey these look. 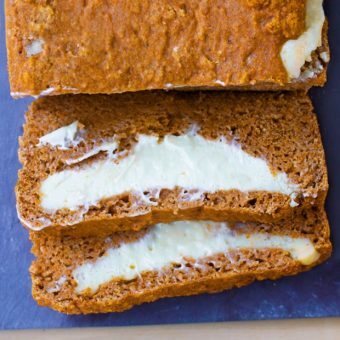 Loved loved loved your pumpkin snack cake last year, so this looks just as tasty!! YUM! Is it weird that I thought your workout brownies were originally for prepping, then exercising while the brownies bake? Hahaha, now that I know they’re mainly for a post-workout meal, everything makes more sense! 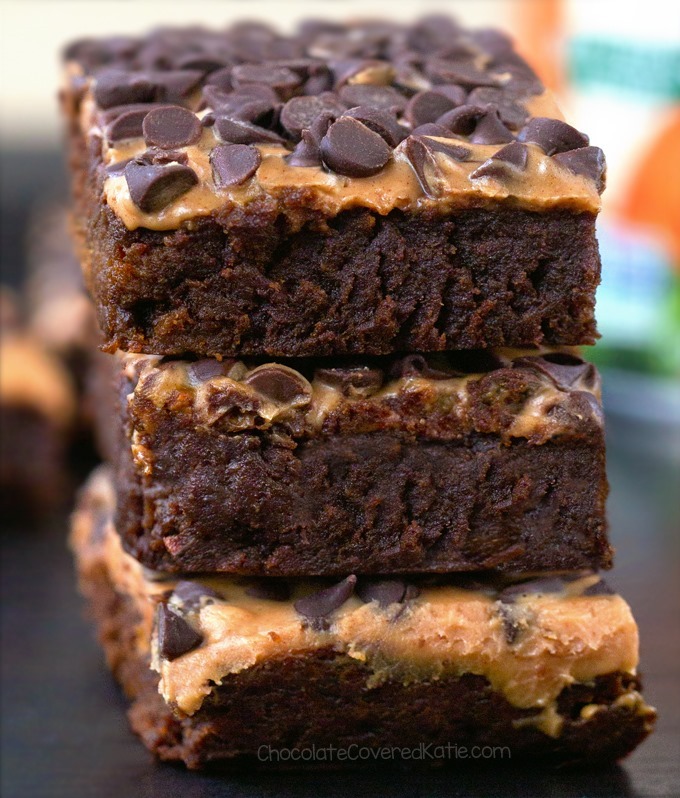 These workout brownies look absolutely delicious though. I’m so happy the fall season is here to enjoy ALLLLLL the pumpkin-flavored treats! Oh my! Where has this blog been all my life?! Just kidding, I definitely didnt cook much until I became a Homemaker. But, man, I wish I found this five years ago when I started cooking more. I have a mouth full of sweet teeth and love me some comfort foods! My little goblins do too! I’ve been slowly altering recipes more and more to make them more healthy, but yay! You’ve already done the work! We made and scarfed down some chocolates from your recipes and cannot wait to try some of these. Yummy! 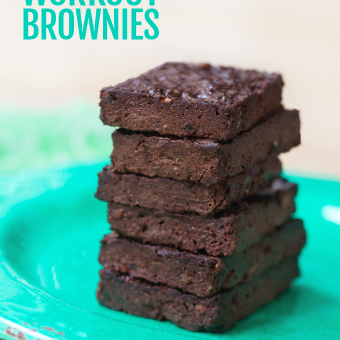 Love the idea of post workout brownie…who wouldn’t!!! But when you were running seriously, did you make your own fuel to carry with you? Could you share your thoughts on running fuel? Wow!This one looks delicious.I’m gonna try this tomorrow and it is my birthday.I hope my friends are gonna love this if I make this exactly how you instructed. Have you tried instant coffee powder/granules? It seems much more powerful than using espresso liquid in recipes. These are now my go to pre workout snack in the morning! I got a massive pumpkin off my dad so found this recipe and it’s awesome. Cooked the pumpkin up and portioned the puree into bags ready for this recipe and froze them, so I can whip up a batch in mins. I also freeze the unfrosted brownies so I can just grab them out the freezer when I need them! Ive experimented using different flavoured protein powder too. My fav is pecan pie! Thank you Katie!!! !